Anese Cavanaugh’s first brush with leadership started with a white lie. Anese was fourteen years old and her parents were in the middle of a messy split. Looking for an outlet, she decided to apply for a job scooping World Class Chocolate at Baskin Robbins — but there was one problem: you had to be 15 years old to work there. Determined to get the job anyway, Anese lied on the application and said she was fifteen. Anese went home thinking she’d blown her chance at the job. To her surprise, they called her two days later and said she’d landed the job after all — because of the integrity she’d shown by owning up to her mistake and being truthful. She was overjoyed that she not only got the job, but also possessed some mysterious quality called integrity. Those ideas took root in Anese and she began thinking deeply about the impact she was having on the people in her life. How did she make her family feel? Her friends? The customers she served? Herself? Was the way she showed up in her life helping things go better or not? It might sound strange for a teenager to be thinking about such philosophical concepts, but in the midst of her parents’ divorce, it gave Anese a sense of control and a new way to take care of herself and her three younger sisters. Those were the early beginnings of what would become The IEP Method®, which stands for Intentional Energetic Presence®. 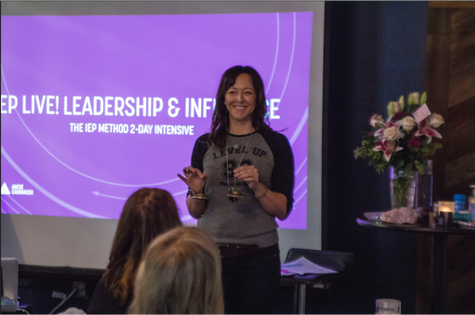 The IEP Method is Anese’s 3-part methodology for helping leaders show up more powerfully. What started as a childhood coping mechanism has blossomed into a full business — today, Anese is an author, speaker, advisor, and creator of the IEP Method. She is an expert on the intention, energy, and presence that is key to success in leadership and organizational well-being. Anese has always been passionate about these ideas, but it took her years to actually start a business around it. Up until she had her first child in 2000, she worked for other people: she worked in healthcare, she did a stint in corporate America, and she used her kinesiology degree to work with athletes. But when she had her son, her priorities changed. That lasted for about a year and a half, until one day when Anese was in her gym’s parking lot waiting for her son to wake up from a nap. As she sat in her car thinking, she was overcome by a quiet nudging she’d been feeling for awhile: she really missed her work. But what job would be worth leaving her son for? Anese’s IEP Method puts a process around the powerfully simple idea of being present and showing up, and it’s garnering attention across industries. She’s brought her methodology to business leaders around the world, from New York to Shanghai, to students and teachers, and even to Law Enforcement and the Navy. Anese’s work is devoted to helping people show up and bring their best selves to the table in order to create significant positive impact in their lives — personally and professionally. So when she and her husband faced their own divorce after 18 years together, she challenged herself to practice what she preaches. Anese’s methodology and philosophies gave them the tools to navigate one of the most difficult experiences a person can endure. Instead of getting caught up in the usual pitfalls of divorce, they took a design approach to the process. They both have custody and live just four miles from one another — they made a commitment to stay in the area until their kids finish school. The mediator they hired told them it was the most collaborative and intentional divorce she’d ever handled. Still, co-parenting has its unique challenges, and it’s raised the stakes for Anese to embrace her own philosophies. In the office and at home, Anese encourages people to understand their impact and be intentional about it. When you’re in a conversation, how present are you in that moment? Are you really giving your full attention or are you thinking about what you have to do next? Is your intention ‘in service of,’ or is it self-focused (and do you even have an intention)? Anese believes that just by being more aware, you can reboot your presence and craft an impact that gets you the result you want. To hear more of Anese’s story and interviews with other purpose-driven leaders, tune into my Growing with Purpose podcast.